1965 Arizona Inspection Sticker - $20.00 : Bob Hoyts Classic Inspection Stickers, Add a Final Touch to your Restoration! 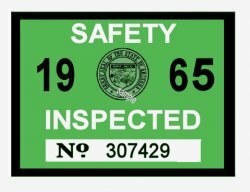 This 1965 Arizona Inspection sticker was a surprize since everyone we have talked with believes that Arizona has never had inspections. More information will be provided as we learn more. This sticker has been restored and reproduced directly from an original both front and back.